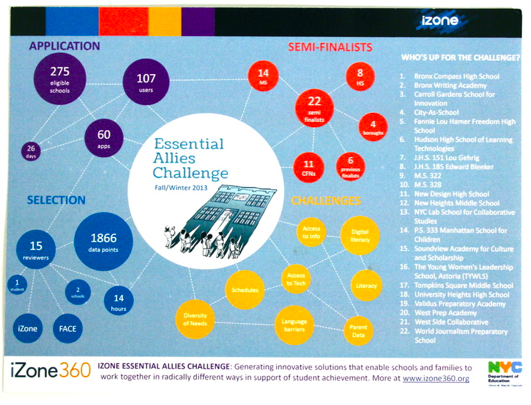 Through our partnership with iZone 360, we are proud to announce that we have entered the iZone Essential Allies Challenge. This challenge asks each school to generate innovative solutions that will enable school and families to work together, in radically different ways, in support of student achievement. Very inspired by the possibilities, we submitted a 90 second video with our ideas. Our team was selected as a semifinalist to Round I! Check out our video submission at EAC VIDEO SUBMISSIONS. PLEASE SHOW SUPPORT TO OUR VIDEO BY "ENDORSING" US. TO ENDORSE A VIDEO, CLICK "YES!" AND THE SUBMIT BUTTON UNDERNEATH THE VIDEO. PLEASE SHARE THIS SITE SO OTHERS CAN SHOW THEIR SUPPORT, TOO! We want to find out the best way to encourage and increase family involvement at every level. Our next step requires gathering data from our community through one on one interviews, SLT and PA meetings and via surveys. Click here to take the Challenge Survey to share your thoughts and ideas. Please take a few minutes to respond, the survey is anonymous. We value your input, and really want to hear from you!